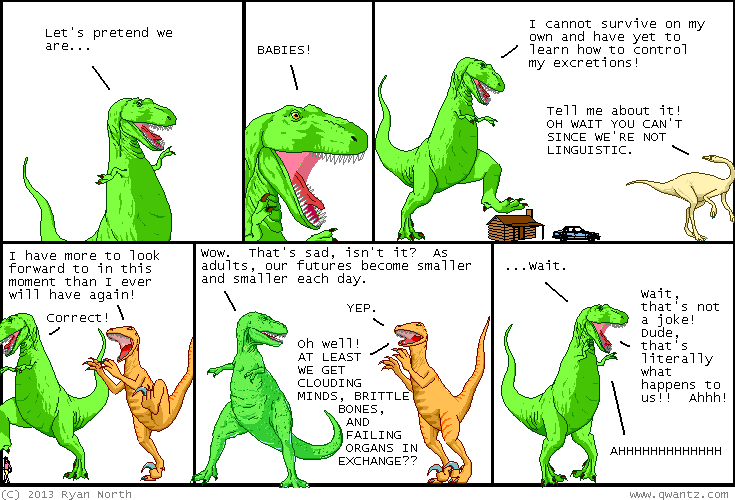 Dinosaur Comics - December 11th, 2013 - awesome fun times! December 11th, 2013: This is another comic I wrote on my whiteboard! They form a series. A SERIES OF IMAGINATION. Also you can probably tell my whiteboard comics because they have fewer words in them. My handwriting is much larger "irl" (in real life) than it is "otciuu" (on the computer I usually use). Are you guys reading the Galaga comic I do with Chris and Anthony? Because IF NOT here is a new way for me to say "hey maybe you wanna read it brotimes": Galaga is on Comics Alliance's best comics of the year list! With This Is How You Die being on The AV Club's best of 2013 list yesterday this has been a real good week for Stuff Ryan Did Getting On Lists!